The Reddish Scops Owl is a very small owl with prominent ear-tufts and an overall reddish-brown appearance. It is also known as the Rufous Scops Owl. A pale and dark morph are known to exist. Typical call - Taman Negara, Pahang, Malaysia. April 1990. CC Dave Farrow. Description: Pale morph: The facial disc is cinnamon-buff, becoming paler towards the edge, and bordered by a dark brown rim. The prominent ear-tufts are flecked with white, blackish, and rufous-brown. The eyes are chestnut-brown or amber-brown with pink to pale reddish-brown eyelids. The bill is horn-white. Upperparts including the crown are tawny rufous-brown, with elongated or triangular pale fulvous spots bordered with black. These spots become larger on the mantle and wing-coverts and become shaft-stripes on the back and rump. Scapulars have pale ochre outer webs and dark spots. Primaries are ochre with very prominent blackish bars; secondaries are ocher-brown with darker brown bars. The tail is rufous-brown, mottled with black and with indistinct pale bars which are clearest on the central rectrices. Underparts are cinnamon-buff with sparse spots similar to those on the upperparts. The relatively large, pale flesh coloured feet are feathered pale buff to the base of the yellowish toes. Claws are horn coloured. Dark morph: Similar pattern to the light morph, but much darker cinnamon-brown above and below. Size: Length 15-18cm. Wing length 127-137mm. Tail length 58-68mm. Weight 70.5-83g. Habits: Little known. The Reddish Scops Owl is a nocturnal owl. 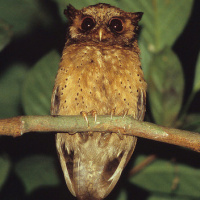 It has generally been encountered at lower levels in the forest than most other species of Scops Owls. Voice: A drawn-out empty sounding "heeooh" uttered at well spaced intervals. Hunting & Food: Feeds on insects, mainly grasshoppers and crickets. This owl has also been known to take crabs. Breeding: Little information available. Breeds in tree holes, and old barbet or woodpecker holes. In Java, eggs have been found in March and April, and a downy nestling observed in mid July. Habitat: The Reddish Scops Owl is found in lowland evergreen, foothill, and submontane forests, and also logged primary and secondary forest; mostly in lowlands, but has been recorded up to 1350m elevation. 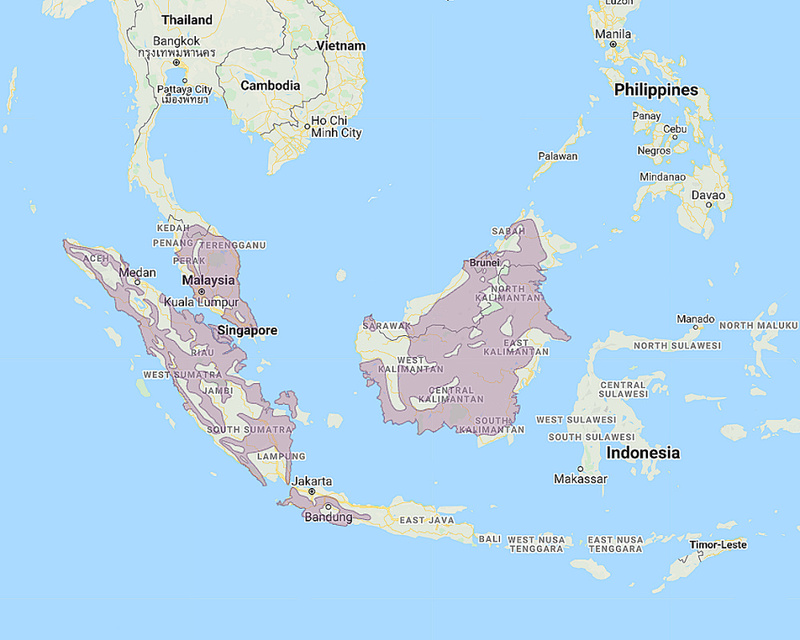 Distribution: Southern part of peninsular Thailand, Malay Peninsula, Sumatra, Java and Borneo. Original Description: Horsfield, Thomas. 1821. Transactions of the Linnean Society of London, 13, pt. 1, Spec. 4, p. 140.